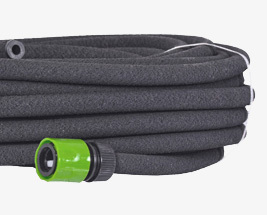 Soaker hoses provide a cost-effective and easy way to water hedging, beds, and borders. They easily connect to garden taps and hose pipes using standard connectors, and irrigation supply pipes using barbed connections. Unlike regular hoses, soaker hoses are porous and allow water to soak through across the whole length of the hose. The water is released slowly and consistently, which makes it ideal for hedges and beds where you don't want to set up individual drippers.